Manchester United had a luckless night in their Champions League opener as Luke Shaw suffered a double leg break during defeat by PSV Eindhoven. Shaw was chopped down by Hector Moreno before being carried off early on. After a long delay, Memphis Depay scored a weaving opener on his return to PSV, but in first-half injury time Moreno headed in from a corner. PSV's Luciano Narsingh headed in a 57th-minute winner despite United dominating for long periods. Unlike previous games this season where Louis van Gaal's side have struggled to turn their superiority into chances, they chalked up 17 shots on goal to PSV's six. There were encouraging displays from Depay, who scored his third of the season, and Anthony Martial, who made his full debut following his wonder goal during the win over Liverpool last Saturday. Poor finishing let the visitors down, although their biggest concern will be over Shaw who will now suffer a lengthy lay-off. United started the game well but after 15 minutes they were rocked by the injury to Shaw, who has made a positive start to his second season at Old Trafford. The England full-back burst into the box after riding two challenges, but as he bore down on goal he was scythed down by Moreno and from the Mexico defender's immediate reaction, it was clear that the injury to Shaw was serious. Replays showed that his right leg appeared to be broken and after 10 minutes of treatment the 20-year-old was taken off on a stretcher to sympathetic applause from the PSV fans. There was no punishment for Moreno, who equalised in first-half stoppage time. With a lengthy absence to come, left-back Shaw's inclusion in the England squad at Euro 2016 must be in some doubt. Depay may not have scored in the Premier League so far, but fresh from his £31m move from PSV to Manchester United in June, the 21-year-old looked at home on his return to the Philips Stadium. The forward, who scored 22 league goals for PSV en route to the Eredivisie title last season, started down the left and linked up well with striker Martial, who showed no signs of nervousness despite his tender age of 19 and his £36m transfer fee. Depay's goal was not dissimilar to Martial's effort at Old Trafford against Liverpool. Played through by Daley Blind, he cut inside, and beat Jeroen Zoet with some ease. When the scores were level, the Dutchman could have added to his tally after a smart one-two with Martial but struck straight at the PSV goalkeeper. In addition to their profligacy in front of goal, United were also guilty of contributing to both PSV goals. The first, which came from Moreno's header, bounced off Blind's head and wrong-footed Ashley Young, who was well placed to stop the initial effort on the goalline. The second was well taken by Narsingh, who headed in a delightful left-wing cross by Maxime Lestienne, but Matteo Darmian was guilty of giving the ball away in his own half. There was plenty of time to recover, and Depay had several chances to double his tally despite switching onto the right side during the second half. Juan Mata was perhaps guilty of the worst miss by failing to control a chipped ball by Bastian Schweinsteiger. There was plenty of encouragement for Van Gaal's side, who will face Wolfsburg at Old Trafford on 30 September before travelling to CSKA Moscow on 21 October, and Martial gave them added power and pace up front. But they will be disappointed not to have earned at least a point on their return to the Champions League after a year's absence. Manchester United boss Louis van Gaal: "It's the same game as against Swansea. We are dominating the game, we are creating chances and we are not finishing. The first chance they have, the corner kick, they scored. "The second goal, we were attacking and then we lose the ball in the first phase and they scored. It's fantastic for PSV but for us it is very bad." Match ends, PSV Eindhoven 2, Manchester United 1. Second Half ends, PSV Eindhoven 2, Manchester United 1. Attempt blocked. Memphis Depay (Manchester United) right footed shot from outside the box is blocked. Hand ball by Santiago Arias (PSV Eindhoven). Corner, Manchester United. Conceded by Santiago Arias. Attempt blocked. Marouane Fellaini (Manchester United) right footed shot from the centre of the box is blocked. Assisted by Juan Mata. 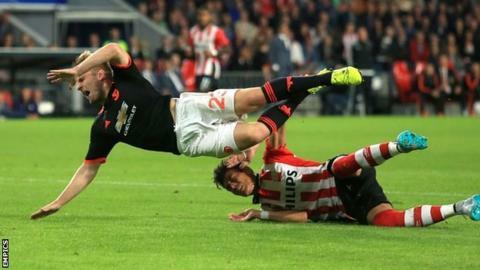 Foul by Stijn Schaars (PSV Eindhoven). Attempt missed. Marouane Fellaini (Manchester United) right footed shot from outside the box misses to the left. Assisted by Marcos Rojo. Substitution, PSV Eindhoven. Jürgen Locadia replaces Maxime Lestienne. Substitution, Manchester United. Antonio Valencia replaces Ashley Young. Attempt missed. Luuk de Jong (PSV Eindhoven) left footed shot from the left side of the box is close, but misses the top left corner. Assisted by Maxime Lestienne. Attempt saved. Maxime Lestienne (PSV Eindhoven) left footed shot from the left side of the box is saved in the top right corner. Assisted by Davy Pröpper. Corner, PSV Eindhoven. Conceded by Chris Smalling. Attempt missed. Anthony Martial (Manchester United) right footed shot from the right side of the box misses to the left. Assisted by Memphis Depay. Attempt blocked. Ashley Young (Manchester United) right footed shot from the left side of the box is blocked. Assisted by Juan Mata. Davy Pröpper (PSV Eindhoven) wins a free kick in the defensive half. Substitution, PSV Eindhoven. Stijn Schaars replaces Andrés Guardado because of an injury. Jeffrey Bruma (PSV Eindhoven) is shown the yellow card. Corner, Manchester United. Conceded by Maxime Lestienne. Delay in match Andrés Guardado (PSV Eindhoven) because of an injury. Andrés Guardado (PSV Eindhoven) wins a free kick in the defensive half. Attempt blocked. Ashley Young (Manchester United) right footed shot from the centre of the box is blocked. Assisted by Juan Mata. Attempt saved. Ander Herrera (Manchester United) right footed shot from outside the box is saved in the top centre of the goal. Assisted by Ashley Young. Attempt saved. Joshua Brenet (PSV Eindhoven) right footed shot from outside the box is saved in the bottom right corner. Assisted by Davy Pröpper. Jorrit Hendrix (PSV Eindhoven) wins a free kick in the attacking half. Ashley Young (Manchester United) wins a free kick in the attacking half. Attempt missed. Juan Mata (Manchester United) left footed shot from outside the box is too high. Assisted by Anthony Martial.